Einstok Toasted Porter is a craft beer from Iceland . 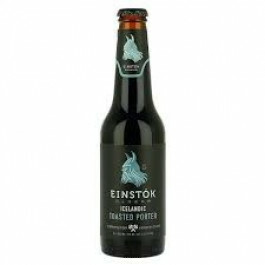 Einstok Icelandic Toasted Porter with clear notes of toffee and dark chocolate, this Porter is roasty and rich, offering a medium body that is robust, yet smooth on the palate. Toasted and chocolate malts give it a sinister black color, but its easy-to-drink taste will have you believing there’s no need to be afraid of the dark. Einstok Icelandic Toasted Porter is smooth and roasty with some chocolate, toffee and licorice notes, with a subtle coffee undertone. Einstok Toasted Porter is rich and roasty notes bring out the best of steak, lamb chops, game and roasts.